Anyone who says that public libraries are obsolete or that semi-random, serendipitous access to printed books is not important any more is a bellend, simple as that. Without my local public library I would never have found out half the enlightening, useful and inspiring things I know. The internet is immensely valuable but it just isn’t the same. I’ll admit that what follows is quite esoteric, but you never know when you’ll need to make some fake brain matter. Perhaps I’ll do my long-cherished grand guignol theatre project some time soon. These recipes come from a (surprise!) rarely borrowed book called Special Effects Make-up, published fairly recently by Methuen, translated from Danish. No, I don’t know why there’s a demand for home-made gore effects in Denmark either. There just is, OK? A write-up on this subject has been on my site that deals with my work as an artist and writer, because I’ve been sporadically researching it as a potential new film project. I’m repeating and expanding it here because I think the subject is interesting in its own right. It’s another in my series of Suffolk weirdnesses; see also Ipswich smells like space and my visit to the weapons research facility at Orford Ness. 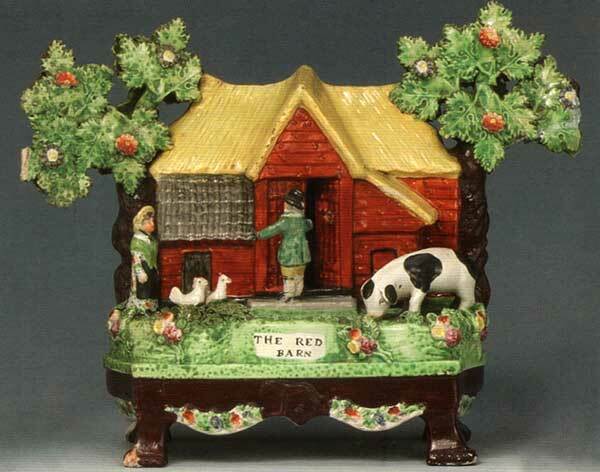 Part of a Staffordshire pottery set exploiting the Red Barn mania: here Corder is enticing Maria into a ridiculously romanticised version of the agricultural barn where he will shortly afterwards murder her and bury her body. In May 1827, Maria Marten was shot to death by the father of her child, William Corder, at a farm near Polstead in Suffolk. This was and is a bucolic location whose appearance can be judged from the many paintings done of the area by the Suffolk painter John Constable, he of ‘The Hay Wain’, who focused his attention only a few miles east at Dedham and East Bergholt. The illegitimate child had already been disposed of secretly by Marten and Corder. William buried Maria in a shallow grave in a barn on his tenant farm, where she was found accidentally nearly a year later by her own father after he ”put down a mole spike into the floor… and brought up something black, which I smelt and thought it smelt like decayed flesh.” Corder had fled to London, but was eventually caught and hanged. Zombies in popular culture have always been placeholders for a barely repressed loathing of the masses. Some part of us believes or fears that most other people in the world are ignorant, they’re unhygienic, they’re easily led and above all that they’re useless mouths; all they want to do is consume without contributing or providing anything in exchange. The zombie genre allows us to sublimate and work through a vicarious holocaust of this surplus humanity.